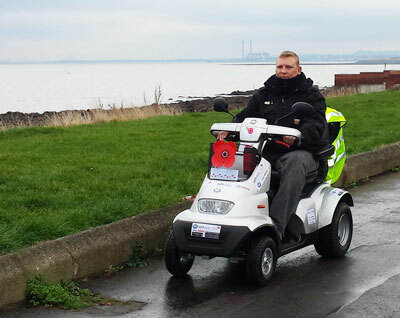 ANDY McIntosh, a retired Army corporal from Strathaven near Glasgow, drove a TGA Breeze mobility scooter 100 miles to raise money for military charities on the 100th World War One anniversary. The ex-Serviceman, who has severe mobility difficulties, drove for three days from Cresswell in Northumberland to the headquarters of Poppy Scotland in Edinburgh. Following an epic coastal journey, his arrival was timed to coincide with the 100 year anniversary of the beginning of World War One – Armistice Day. He has raised funds and awareness for Poppy Scotland, SSAFA and ABF The Soldier’s Charity as a way of thanking them for supporting him and his family. 42 year old Andy said: “When I arrived at Poppy Scotland it was so emotional for me as all the charity’s staff were out to greet me along with children from an Edinburgh school and a large number of local workers. Originally from Manchester, Andy served in The Cheshire Regiment for 14 years and experienced frontline action in Bosnia, Iraq and Northern Ireland. He retired from the Army fully fit to pursue a new career, but in 2008 he received devastating news when doctors discovered he had a very rare vascular condition. Andy had to come to terms with a lifestyle governed by disability, but he has now regained his verve for life and these TGA scooter challenges are the perfect focus for rebuilding his sense of achievement. Daniel Stone, TGA Managing Director concluded: “The TGA team and I would like to fully congratulate Andy on his remarkable achievement. “Bearing in mind the pain and mobility difficulties this veteran has to deal with daily, organising and completing this challenge must be commended. We believe the three charities Andy has raised funds for fully deserve the donations as their support of ex-Servicemen and women is essential.